You are at:Home»ETF Strategist Channel»Is India’s Growth Reasonably Priced? 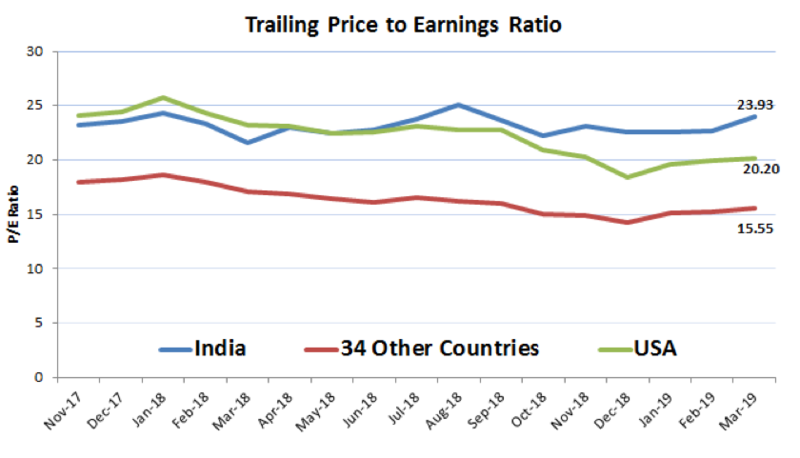 Is India’s Growth Reasonable Priced? Recent price momentum suggests India’s expected growth is both realistic and attractive to global investors. The MSCI India Index returned 9.2% in March, outperforming 45 other countries. Over that same period, Indian equities saw Foreign Institutional Investor (FII) inflows of US$4.3bn, the largest monthly buying seen in the past two years. Year-to-date through March 31st, Foreign Institutional Investors have net bought US$6.6bn in Indian equities, the largest among all of the EM Asian markets. Foreign institutional ownership (as % total India market cap) has increased to 19.3% (0.5% higher than start of the year), but still remains below 2015 peak of about 21%. The 2019 fund flows are being channeled into Banks, Energy and Utilities, while limiting Staples and Metals/Mining (Goldman Sachs Research). INDA, EPI, and INDY are the 3 most popular India ETFs (by AUM). Relative to INDA (iShares MSCI India ETF), EPI offers higher allocations to Energy and Materials and lower allocations to Consumer Staples and Technology. Meanwhile, INDY (relative to INDA) provides meaningfully higher exposure to Financials paired with less exposure to Technology, Healthcare and Energy. 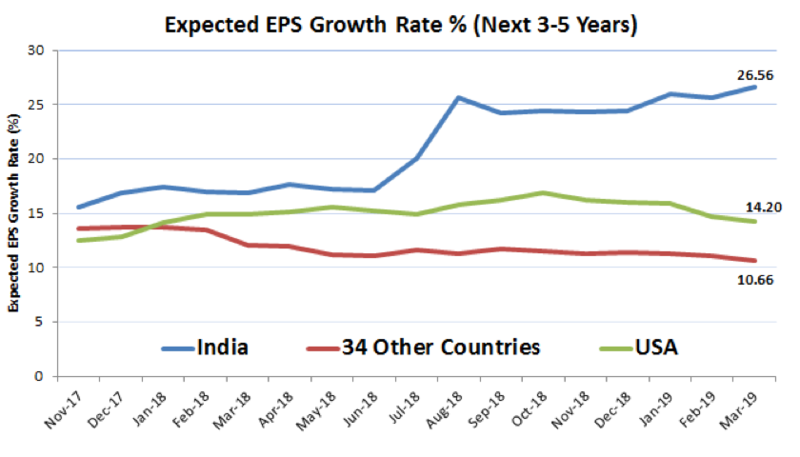 Forecasted earnings growth can shift higher for a variety of reasons, but confidence around India’s growth appears to be building heading into April 11th general elections. In fact, foreign fund flows into India have accelerated heading into and coming out of the last 4 general elections (Goldman Sachs Research). 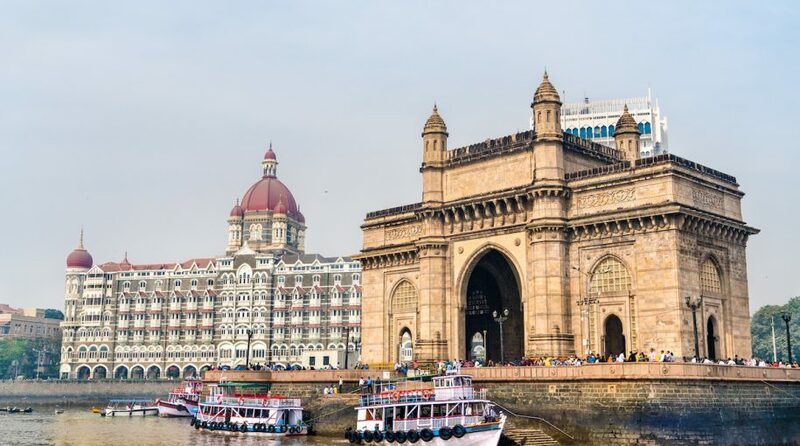 Given a stable political environment, an accelerated pace of reforms, and a huge surge in working age population, India appears well positioned to deliver high economic and corporate profit growth. 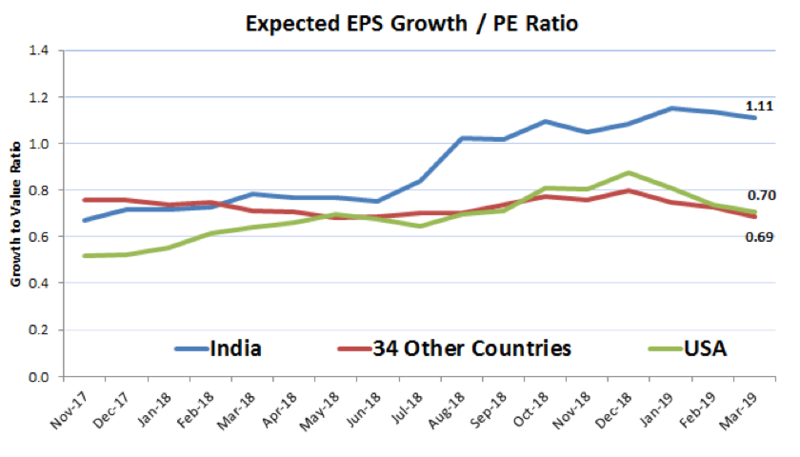 Only the future can tell, but foreign investment and price momentum suggest that 23.9x earnings is a “reasonable” price for India’s 26.6% EPS growth. This goes to show, when growth is in short supply (globally), growth at a reasonable price can be increasingly expensive. This article was written by the team at Accuvest, a participant in the ETF Strategist Channel. This article was written by James Calhoun, a Portfolio Manager at Accuvest Global Advisors. This article is strictly informational and should be used for research use only. It should not be construed as advertising material. The opinions expressed are not intended to provide investing or other advice or guidance with respect to the matters addressed in this brochure. All relevant facts, including individual circumstances, need to be considered by the reader to arrive at investment conclusions to comply with matters addressed in this brochure. Charts and information are sourced from Accuvest, unless otherwise noted. Remember that investing involves risks, as the value of your investment will fluctuate over time and you may gain or lose money. You should seek advice from your financial adviser before making investment decisions. Investment risks are borne solely by the investor and not by AGA. AGA is an independent investment advisor registered with the SEC. All disclosures, marketing brochures, and supplemental firm sheets are available upon request.